Diabetes is an increasingly common condition. According to the American Diabetes Association (ADA), approximately 1.4 million new cases are diagnosed every year in the U.S. Diabetes can be challenging to control, and many natural remedies, including cucumbers, are touted to help lower blood sugars. While not a cure, cucumbers -- like other vegetables and fruits -- contain certain nutrients and natural chemicals that may benefit people with diabetes. Limited animal studies link cucumber extracts to lower blood sugar readings, but more research is needed to determine if this vegetable might improve blood sugars in those with diabetes. 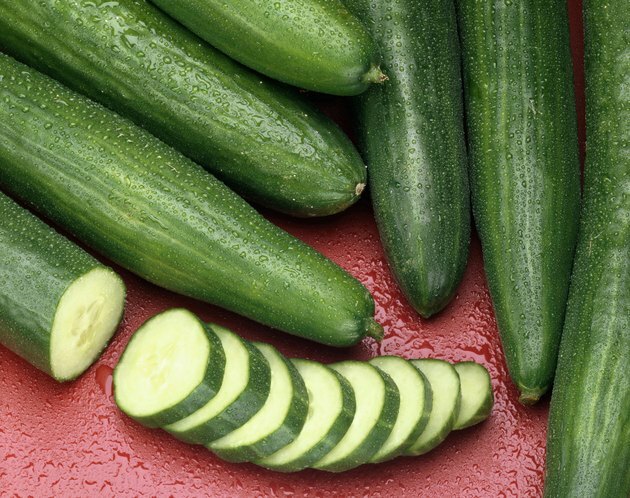 Animal research has linked cucumber extracts to improved blood sugars. A study published in the September-October 2011 issue of "Iranian Journal of Basic Medical Sciences" determined that blood sugars decreased in diabetic rats after a nine-day diet of cucumber seed extract. Another animal study published in the October 2014 issue of "Journal of Medicinal Plant Research" demonstrated that cucumber pulp extract lowered blood sugar. This study isolated chemicals from the cucumber that have previously been linked to blood sugar lowering properties. However, similar human research on the blood sugar effects of cucumbers is not available. Further study is needed to identify the beneficial components in cucumber, and to identify if whole cucumber has the same benefits as the cucumber extracts used in these studies. Certain substances improve blood sugars by stimulating insulin release, improving insulin action or decreasing the body's production of sugar -- all mechanisms that reduce blood sugar levels. Authors of a study published in the January 2013 issue of "Journal of Scientific Research" suggest that cucumber's phytonutrients -- specific plant chemicals and nutrients that reduce disease risk and promote health -- are linked to its blood sugar lowering effects. One such nutrient is fiber, known to provide blood sugar benefits. While cucumber is not particularly high in fiber, improvements in blood sugars could be realized if the extracts used in the animal studies were more concentrated in fiber and other phytonutrients compared to whole cucumber. Because cucumbers are low in carbohydrates and a source of fiber, they fit easily into a diabetes meal plan. The ADA recommends people with type 2 diabetes consume a nutritious, high fiber diet -- including three to five servings of vegetables a day. Fiber has many health benefits, including providing a sense of fullness, curbing appetite and helping with blood sugar control. Carbohydrate foods have the most impact on blood sugar levels, so the type and quantity of these foods is important. Usually a moderate amount works best, as too many carbohydrates -- found in the starch and sugar in foods -- can cause blood sugar levels to rise too high. Many low-carbohydrate vegetables, including cucumbers, do not worsen blood sugar levels and can be eaten liberally in this diet. Although animal studies suggest cucumber extracts have beneficial blood sugar lowing properties, there's no evidence that whole cucumbers or even cucumber juice provides the same benefit. In short, cucumbers are not a cure for diabetes. Instead, cucumbers are a nutritious vegetable that can be eaten liberally in a diabetes meal plan. For guidance on natural remedies, consult your diabetes care team. A dietitian can explain how to eat to manage blood sugars, and develop a customized meal plan that incorporates food preferences and specific medical nutrition needs. Diabetes medications should not be discontinued or changed without your doctor's approval. Seek immediate medical care if you are not able to keep food down due to severe nausea or vomiting or if you experience consistent blood sugar levels above 240 mg/dL. Can Tomatoes Raise Blood Sugar in Diabetics?